On their way to Steamboat Springs, Colo., skiers and snowboarders from Denver skirt the open, snow-covered pastures of the Yampa River Valley. Snowhounds who enjoy those condo-free vistas can now help preserve them - by chowing down on hamburgers after a day on the slopes. An alliance of Routt County ranchers, conservationists, officials and business owners is hoping to keep ranchers in business - and development pressures at bay - by producing and marketing premium-priced beef. The Yampa Valley Beef Corp., now in its second year, supplies more than a dozen restaurants in Steamboat Springs and surrounding communities. At least 25 percent of the beef comes from cattle that have grazed on land protected by conservation easements, and a portion of the profits are donated to a local land trust. "You can't approach conservation in a vacuum. You have to look at the other aspects - the economics that are tied into all of this," says Susan Otis, executive director of the Yampa Valley Land Trust, which recently received a $500 donation from the company. As development in the area increases, local ranchers are tempted with offers of up to $10,000 an acre. Routt County loses about 11,000 acres of agricultural land each year. In late 1997, the local Nature Conservancy office, the Steamboat Springs Chamber of Commerce and the Routt County Extension Office began discussing ways to build a niche market for the area's cattle ranchers. To appeal to conservation-minded consumers, the group decided to link the effort to land trusts. "That way, the benefits are measurable to the general public," says C.J. Mucklow, the agricultural extension agent who helped organize and launch the program. With $13,000 in grants from various sources, a host of volunteers, a diverse board of directors and 12 ranchers as members, the company started pitching its product to local businesses. The cooperatively run company now counts 22 ranchers as members and has sold more than 30,000 pounds of beef - the equivalent of 52 head of cattle. Eight of the ranchers own or lease land under easement, and more than half of the cattle purchased by the company grazed on conserved land, with easements held by the Yampa Valley Land Trust, The Nature Conservancy, American Farmland Trust and the Rocky Mountain Elk Foundation. In addition to the 7 percent premium the ranchers receive for Yampa Valley Beef cattle, they save on transportation costs by selling the cows locally. The end result: an extra $90 or so for each cow sold. At the moment, however, the company buys only one to eight cows annually from each rancher. "Every dollar that I can put in my pocket makes a little difference," says Dean Rossi, a third-generation rancher who, along with his brother's family, manages several hundred cows on their 8,000-acre ranch near Phippsburg, Colo. The company offers premium cuts during the winter holidays, shipping packages directly to consumers around the country. The ground beef, available year-round, is bought by local restaurants and grocery stores. Steamboat Ski and Resort Corp., the company's biggest customer, will purchase 14,000 pounds of Yampa Valley Beef this year. At Steamboat Brewery & Tavern in downtown Steamboat Springs, the Yampa hamburger - which sells for $8.99 - is as popular as the establishment's less expensive burger, says chef Michael Williams. "It's really amazing how well it sells," Williams says. "People love it. They can identify with eating something that comes from the valley." 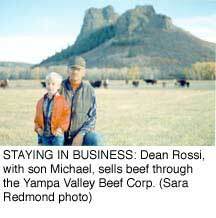 The Yampa Valley Beef Corp. is counting on more reactions like those to build demand for its product - and put a bit more cash into ranchers' hands. Says Mucklow, "I think within five years we can triple the amount of livestock we're dealing with and really make a difference." Brenda Biondo writes from Colorado Springs, Colorado.